Modus operandi is the same: we can choose a dish from one of IHCC's twelve chefs. This time round, the chosen dish must contain at least three of these mystery ingredients: brie, crab, chives, pecans, strawberries (fresh, frozen or dried), vanilla, breadcrumbs, green beans, vinegar, puff pastry. So, I tried searching again and found Giada's Mediterranean Farro Salad. I can't find farro in Malaysia. Ordering online sounds too much of a hassle. The closest substitute is barley and I also add some quinoa. Most importantly, this recipe has these three mystery ingredients: chives, green beans, vinegar. 1. In a medium saucepan, combine 4 cups of water with the barley and quinoa. Bring to a boil over high heat. Cover and simmer over medium-low heat, about 20 minutes. Drain well. Transfer to a large bowl and let cool. 2. 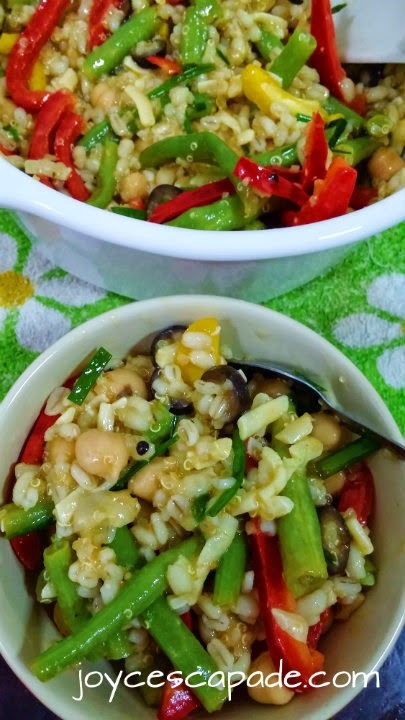 Once the barley and quinoa are cooled, add green beans, chickpeas, black olives, red pepper, yellow pepper, Parmesan, and chives. Stir to combine. 3. In a small bowl, mix together apple cider vinegar, olive oil, mustard, salt, and pepper. Stir to combine. Pour the vinaigrette over the salad. Toss to combine and serve. I love the rainbow colors! The vinaigrette's tartness blends very well with the rest of the ingredients. As a person who don't like to eat my chives raw because they taste quite similar to scallions, I'm surprised to find that this humble looking herb adds another layer of delicate taste. Adding chickpeas is a great idea because I get more protein and they make this salad a fulfilling main dish. 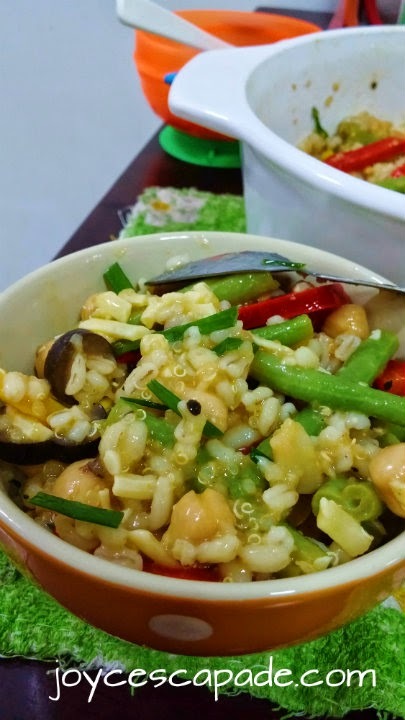 I love the crunch from the barley and quinoa together with chickpeas and black olives. The vegetables - green beans, red & yellow bell pepper - make this salad oh-so-pretty! Overall, this is a really good salad. Thanks Giada for your recipe! 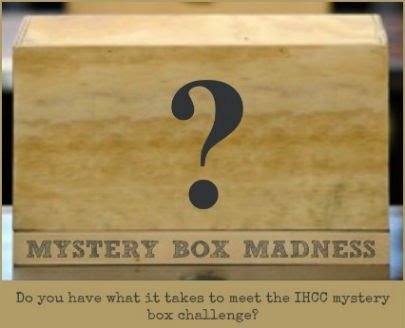 I'm linking this post with I Heart Cooking Clubs (IHCC) for this week's theme, May 2015: Mystery Box Madness Challenge! Good choice. I love mediterranean dishes with their vibrant colors. I have chives growing in my herb garden which I adore with its small purple flowers and tender texture. Hi Joyce, I am new to IHCC but looking forward to participating in the group. I like the Mediterranean salad that you made. I made a dessert with strawberries. 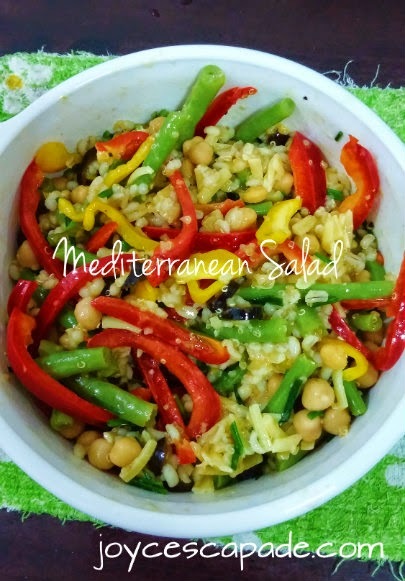 Joyce, I love how pretty and colourful your mediterranean salad looks. As they say, the more colourful your food is naturally, the more nutrients and vitamins they give you. This is definitely better than yummy!! Such a lovely looking dish. Looks so pretty and refreshing, and delicious too! How healthy and delicious does this look and am glad we are connected through the May 2015: Mystery Box Madness Challenge! re IHCC!